I’m proud to announce that the Israel Genealogy Research Association (IGRA) has recently passed a million records in its All Israel Database. IGRA has been working on building this database for five and half years, and it’s an incredible accomplishment to have reached a million records in that time. We’re proud to make these records available to researchers across the globe (you just need to register for free on the site). While I am currently the elected President of IGRA, I completely credit this accomplishment to our database volunteers who have worked hard and consistently for years to reach this stage. Under the leadership of Rosie Feldman, and with the help of Daniel Horowitz and Carol Hoffman, a team of dozens of volunteers have helped scan and index over three hundred data sources adding up to more than one million records. 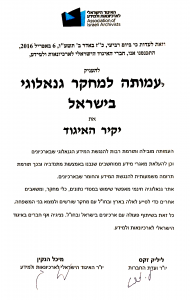 Some recent databases that have been added, or added to, include Petach Tikva Marriages and Divorce 1928-1931, Jerusalem Marriages 1931-1940, British Mandate Marriage and Divorce Certificates, Teacher’s Union Members 1941, Israeli Name Changes 1954, Operation On Eagle’s Wings Immigrants 1949 (from Yemen), Israel Telephone Directory 1963, and Tombstones of the Jewish Cemetery of Salonica, Greece. These databases come from our close collaboration with more than thirty archives, both in Israel and abroad. Some of the archives we work with include the Israel State Archives, the American Jewish Joint Distribution Committee (JDC), the Tel Aviv Municipal Archives, the Petach Tivka History Archives, and the Jerusalem Municipal Archives. Our work was recognized by the Association of Israeli Archivists last year when they presented us with an award in appreciation for our work with their member archives. 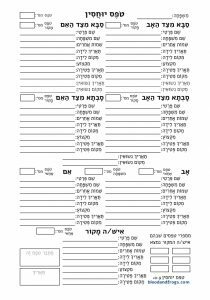 IGRA’s All Israel Database is the only major online genealogy database that is completely bi-lingual, being searchable in both Hebrew and English. IGRA works very hard to insure that databases that originate in Hebrew are searchable in English, and databases that originate in English are searchable in Hebrew. Our bi-lingual database has been made possible with the help of Brooke Schreier Ganz and her LeafSeek platform. Brooke may be better known these days as the head of Reclaim the Records, or her board role at Gesher Galicia, but she is also critical to our success here at IGRA and we are very grateful to all her hard work. Indexing a million records is no easy task, and part of the problem is just coordinating all the work, and making sure the work assigned to people gets completed. To that end, we have been looking for many years for an online tool, similar to those used by Ancestry and FamilySearch for their volunteer indexing efforts. Recently we worked with Banai Feldstein, to insure our requirements were considered as she developed her Crowd-Sourced Indexing (CSI) tool. While other groups are currently using her great indexing tool as well, a quick look at the rankings of top indexers using her platform show they are all indexing IGRA records. Many thanks to Banai for developing the tool that helped push us past the million record mark earlier, and which will enable us to get the next million that much faster. So thank you again to everyone who has made this milestone possible. If you want to help get the next million records online, please sign up at Crowd-Sourced Indexing, and check out the data we’re currently indexing. As of this writing we’re currently indexing the 1963 Telephone Directory in English, as well as a 1939 Petah Tikva Voters List and a 1936 Tel Aviv Voters List in Hebrew. Check back often as we have many other projects in the queue that get posted as soon as we complete what’s online (see the list of 30 completed indexing projects on the site). Lastly, if you’re going to be at the IAJGS International Conference on Jewish Genealogy next month in Orlando, be sure to stop by the Share Fair on Sunday, July 23 between 12:30pm and 4pm (Swan Foyer), or the Israel Research BOF meeting on Monday, July 24 between 3:30pm and 4:45pm (Pelican 2), to meet IGRA volunteers and find out more about the work we do and the databases we are working on. For a long time the most visited page on this site has been my B&F Forms System page. 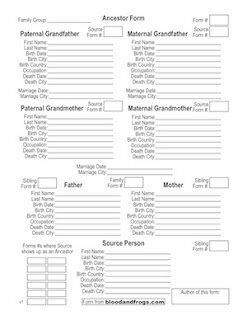 Originally created back in 2011, my B&F Forms System is a series of forms you can use to help you with your genealogy. The forms are designed to be easily fillable either on your computer, or when printed out (and support both Letter-size paper for North American users, and A4 paper for everyone else). The forms have been downloaded tens of thousands of times from this site (and who knows where else they might be available). I have to thank Cyndi’s List and Pinterest (the Ancestor form, for example, is listed on over 2700 boards) for most of the traffic to the forms. While people who religiously enter their genealogy information into a computer genealogy program, or an online genealogy service, may think these forms are not for them, I think you might find they are quite useful, for a few reasons. For the basic Ancestor and Family forms, you can send them to relatives to fill in their information and send back to you. For less tech-saavy relatives, you can print them out for them to fill in by hand and send back to you. For more tech-saavy relatives, you can just send them the PDFs and ask them to fill them out and send them back via e-mail. 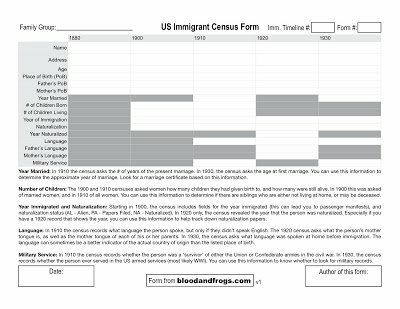 The Ancestor Location and US Immigrant Census forms help you focus your research and help you determine what information you are missing about your ancestors. The Ancestor Location form simply has fields for name, birth date, and birth location for 14 ancestors (two parents, four grandparents, and eight great-grandparents). By taking the time to fill out the form you can see at a quick glance which of these basic pieces of information you are missing, giving you direction on where to focus your research. The US Immigrant Census form lets you fill in all the genealogically-significant information from the 1880 to 1930 census years. This information is not the same foreach year, for example only two years ask when someone was married, only two years ask how many children a woman had, only years 1900 and on ask when a person immigrated, and only 1920 asked what year a person was naturalized. Filling out all of this information for an individual on this form gives you a lot of information to follow up on in your research. These forms and the rest of the forms in the series are also great for people just getting started with their research, allowing them to fill in the forms first, and then use the forms to fill in the information in a program or online service. The forms can also be used by genealogy classes and workshops. Since the forms are the most used resource on this site, I thought it was worth re-visiting them and bringing them to the attention of users of this site that may not have noticed them. So if you haven’t seen the forms before, then go to the B&F Forms System page now and check them out. You can always find them by going to the Forms link in the menu at the top of the page. 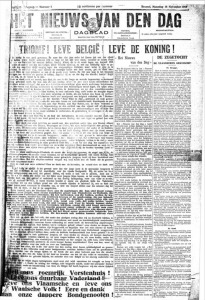 The Royal Library of Belgium has scanned and indexed ten historical newspapers from Belgium, and set up a search interface for them called BelgicaPress. While I don’t have a breakdown of the ranges of each paper, the database of all the papers together ranges from 1831 until 1950 – with a big caveat. While you will get search results for all matches in the database online, all results from 1919 until 1950 are only viewable from within the Library itself, due to copyright issues. That caveat means the database is almost useless for me (at least online), since although I had a lot of family in Belgium, almost all of it arrived there in the 1920s. That said, if you have a fairly unique surname (that isn’t translatable into Flemish or French), and you get many results from the 1919-1950 period, you might at least know its worth checking into and ask someone in Belgium to do a search in the library for you. Of course, there are other things that would be interesting to search besides family names. You could search for your ancestral town name, and see if other people from your town are mentioned in the newspapers. you could also search for information on the Jewish communities there, by using search terms like Jew or Jewish (Jood and Joodse in Flemish, Juif in French). If there were major news items concerning the Jewish communities in other countries (such as pogroms) it’s possible those might also show up. One final note. The site is, as would be expected in Belgium, is available to use in Flemish (NL) and French (FR). I discovered, however, that secretly it also works in English. While there’s no link from the Flemish or French versions of the site to the English version, use the link above and it will indeed go to an English version of the site. Sometimes it might forget you’re using it in English, and not everything is translated, but it’s not bad. It was definitely developed to work in English, even if they haven’t active that yet on the site. I wouldn’t be surprised if they make the English version available one day directly from their main site, but until then, the above link works. If you find yourself on a page that is in Flemish or French and want to see if it’s in English, look at the URL in the address field at the top of your browser and see if it says “lang=FR” or “lang=NL” in the string. If so, just replace the FR or NL with EN and hit return. While researching my previous post about MyHeritage’s new integration with 23andMe, I came across a new study being done by 23andMe on Irritable Bowel Syndrome (IBD) and its related diseases – Ulcerative Colitis and Crohn’s Disease (two very common diseases, particularly among Ashkenazi Jews). The study is being sponsored by drug company Pfizer, and it seeking 10,000 participants. To join the study you must have been diagnosed with either UC or Crohn’s by a doctor, live in the US, have access to the Internet, and be at least six years old (from 6 to 17 you must have parental consent). If you qualify, they send you a saliva collection kit with a return envelope, and you must send back a saliva sample and fill out some online surveys related to your condition. There’s actually one more qualification for the study, or rather a disqualification – if you are already a customer of 23andMe, you cannot participate in this study. If you are already a customer you can fill out some surveys, but it’s not clear if your DNA data will be included in the study. Interestingly, both Ulcerative Colitis and Crohn’s Disease are significantly more common among Ashkenazi Jews than the general population. This probably means that Jewish participants in this study will outnumber their percentage of the general population. It also might mean that if you have the genetic markers that predispose you to these diseases, joining this study might connect you to a large number of potential relatives, since the group is self-selecting, and if the genetic markers are familial, then you’re more likely to find genetic relatives than on average when there are 10,000 other people with the same condition as you. So what do you get for joining the study, besides knowledge that you are helping further scientific research that might one day benefit you personally? Well, for one you get lifetime access to 23andMe’s Personal Genome Service. For the moment that only deals with genetic genealogy, not the health information that 23andMe previously offered (and still offers to customers who signed up before the ban), but that might return in the future. However, if you’re reading this post, chances are you are interested in genealogy, and if you have one of the very common diseases they are researching, and have not yet signed up for 23andMe, this will save you a $99 sign up fee for their service. The only thing different about the account on 23andMe you receive compared to a regular 23andMe customer who would sign up at the same time, is that it seems you cannot participate in the customer forums. The other difference is of course that you know your DNA is being contributed to a specific study on a disease you have. So if you have Ulcerative Colitis or Crohn’s Disease, and have not yet signed up for 23andMe, this is a good opportunity to further science and to get access to 23andMe for free. Go check out the 23andMe IBD Study page for further information. Cadastral Maps, another kind of state-created map, were created at a scale of 1:2,880, or ten times the resolution. This site does not yet have Cadastral Maps, although some Cadastral Maps for the Galicia region can be found in the Gesher Galicia Map Room.